Age Criteria : Age Between 18 to 27 Years, as on 01-01-2018. Essential Qualification : Passed Graduation Degree in Any Discipline and 100 wpm English Shorthand Speed and 40 wpm English Typing Speed and Knowledge of Computer Operation. 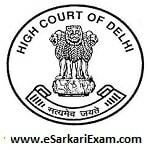 Eligible Candidates can Submit Application at the Official Website of Delhi High Court latest by 12th October 2018. Applicants First Logon to Delhi High Court Official Website. Open Job Openings Link in Public Notices Section. Open Vacancy Notice for Personal Assistant Recruitment Link. Open Apply Online for Personal Assistant Exam 2018 Link. Open Given Link in Notice. Click View Guidelines and Read Instructions Carefully. Click on Fresh Candidates Login Link.